Life has taught me that pain and healing can be unpredictable. 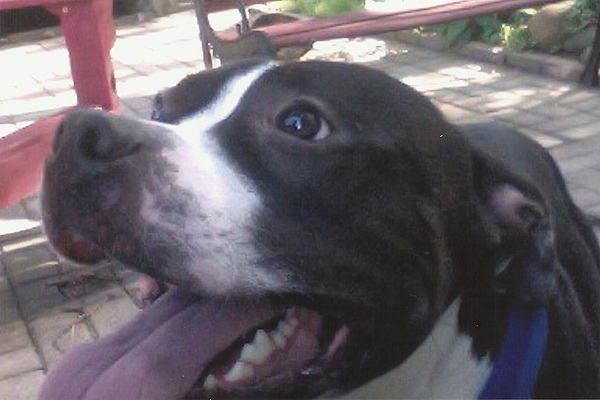 I recently suffered the loss of my beloved pit bull, Herman. Needless to say that hit me hard. For weeks I was a wreck. I’d go from sobbing to completely numb, then back to sobbing. 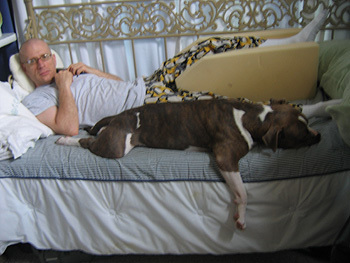 Weeks went by before I could even use the daybed Herman and I spent so much snuggle time on. After two months, I finally mustered the courage to walk over and thank people at the pet supply store for treating Herman like the star he was. It’s also where the animal control facility for my community is based. I figured as long as I was there I’d say “Hi” to the animal control officer on duty. That’s when it happened. A casual conversation lead to a chance encounter that would begin a new phase of my healing process. That chance encounter was with a little pit bull who had been brought in by the city as a stray. 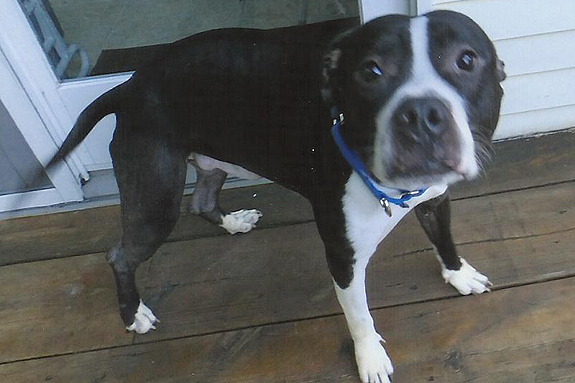 With no trace of this stray pit bull’s personal history to be found, the city was having no luck getting him out of the pound and into a home, or even a rescue. Time was running out for this cute little mystery dog. Memories of clinging to my precious Herman as he drew his final breath left me with no desire to have another animal’s life in my hands right then, and I was in no position to take a dog in even if I wanted to. For some reason, and I still don’t know what that was, I asked to see Buddy, as he was known there. My interaction with this sweet and energetic dog, although brief, was almost surreal. I watched Buddy bounce from one end of the room to the other, as he seemed to dare gravity to hold him. When I caught his eye ever so briefly, I signaled him to sit. I was stunned to see him do so, tail wagging on the floor. He looked up at me expectantly, hoping for a treat. That big goofy pit bull smile sealed the deal. Somehow, someway, I had to get him out of there. I hurried home both excited and confused. When I got home, I flew in a frenzy of motion as I looked up phone numbers and began, with no idea what I would say, to call people. In addition to my own lack of preparedness, the timing was not ideal. It was Sunday, Father’s Day. The odds of finding somebody who could help were not good. Enter the real hero of this story! Ingrid Jacobs! Ingrid was someone I knew had experience with this stuff. Ingrid was very involved with Pet Haven, a local, foster-based rescue. 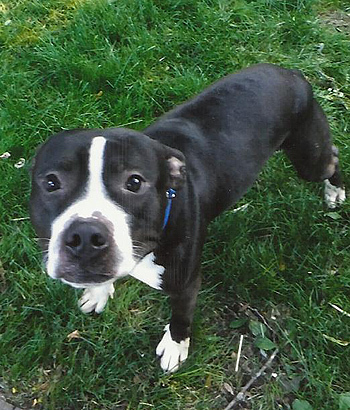 Her own dog, a pit bull, had been a stray before Ingrid adopted her. When I called her, she was, not surprisingly, out with her parents celebrating Father’s Day. Still, she agreed to look into the situation. The next day, I heard my cell phone ring and jumped to get it. Ingrid had been over to see Buddy. Ingrid told me that she had decided to put a hold on our new pit bull friend until she could come back the next day to get him to her vet for an evaluation. I was on pins and needles as I waited for the report. It was great news! Buddy had a clean bill of health and a new name! Ingrid had renamed him Bradbury, after the late Ray Bradbury. The name suited him. By this time it was decided that Bradbury would go home with her for the moment. Soon after that I received word that Ingrid had managed to get precious Bradbury into a no-kill shelter here in Minnesota. This was the best news I could have gotten! Soon, Bradbury was on the multi-hour drive to the place he would stay in safety until he found a furever home. While I grieved over the loss of one precious life, I had watched as another life was saved. In the course of a few short days, Bradbury, and his rescuer Ingrid, had given me some valuable perspective. Looking back on all this, I’m still not sure what came over me. I just know that while I’m still mourning the loss of my angel, Herman, I believe Bradbury came along at just the right time. A chance encounter gave Bradbury hope and, in the process, gave me a new outlook on life. Losing Herman still hurts, but there are many other lives that can be saved when eyes and hearts are open to animals in need right where we live. Matt, much love and sympathy from Diva and me on the loss of your precious Herman. How beautiful a story……how the pain and sorrow of Herman’s passing over the rainbow bridge made it possible for you to help save the life of another precious pitbull. Everything does truly happen for a reason. May your memories and love of Herman sustain you until the day you are reunited and running together across that bridge. Thank you. Before Herman went to to heaven to wait for me I promised him that I’d get back into animal rescue and work to make the world a better place for dogs, especially pibbles. After years of no direct involvement I had no plan for when & where to start. Herman is why I I’m back. God used Herman to show me my purpose in this world. Thank you. Before Herman crossed the bridge, I promised him that I’d return to animal rescue. I promised Herman that I’d work to make the world a better place for pibbles. After years of no active participation in rescue I had no plan, no idea how and where to start. Herman was God’s way of showing my purpose in this world. Thank you. As a Christian, I believe God has a purpose, a calling for all of us. Herman was God’s way of leading me back to my purpose in this world. Before my angel, Herman crossed the bridge, I promised him I would return to animal rescue. I promised I’d work to make the world a better place for animals that have no voice. Years had passed since I was last involved in rescue and I had no idea how, or where, to start. I intend to keep my promise to Herman by being his legacy. Matt that is exactly how I got involved in animal rescue – as a tribute to my dear Percy who passed in 2008. His legacy of love lives on as I have saved many many dogs since then by getting them adopted or into rescues.I have a multi animal household full of love. Love is truely infinite. My heartfelt condolences for your loss. I pray for healing of your painful loss. “Love is truely infinite.” So true! Thank you. SusanneHoshino, you are part of something very special. I can’t imagine a better legacy for Percy. Thank you for helping to save the dogs that you were there for in their time of greatest need. God Bless you.